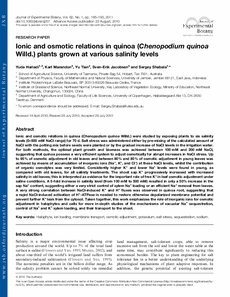 Ionic and osmotic relations in quinoa (Chenopodium quinoa Willd.) were studied by exposing plants to six salinity levels (0-500mM NaCl range) for 70d. Salt stress was administered either by pre-mixing of the calculated amount of NaCl with the potting mix before seeds were planted or by the gradual increase of NaCl levels in the irrigation water. For both methods, the optimal plant growth and biomass was achieved between 100mM and 200mM NaCl, suggesting that quinoa possess a very efficient system to adjust osmotically for abrupt increases in NaCl stress. Up to 95% of osmotic adjustment in old leaves and between 80% and 85% of osmotic adjustment in young leaves was achieved by means of accumulation of inorganic ions (Na+, K+, and Cl-) at these NaCl levels, whilst the contribution of organic osmolytes was very limited. Consistently higher K+ and lower Na+ levels were found in young, as compared with old leaves, for all salinity treatments. The shoot sap K+ progressively increased with increased salinity in old leaves; this is interpreted as evidence for the important role of free K+ in leaf osmotic adjustment under saline conditions. A 5-fold increase in salinity level (from 100mM to 500mM) resulted in only a 50% increase in the sap Na+ content, suggesting either a very strict control of xylem Na+ loading or an efficient Na+ removal from leaves. A very strong correlation between NaCl-induced K+ and H+ fluxes was observed in quinoa root, suggesting that a rapid NaCl-induced activation of H+-ATPase is needed to restore otherwise depolarized membrane potential and prevent further K+ leak from the cytosol. Taken together, this work emphasizes the role of inorganic ions for osmotic adjustment in halophytes and calls for more in-depth studies of the mechanisms of vacuolar Na+ sequestration, control of Na+ and K+ xylem loading, and their transport to the shoot.